Our New Iran Plan Is to Help a Cult Gain Power. What Could Go Wrong? Leaks from State Department officials indicate that, after years of delay, Secretary of State Hillary Clinton has finally decided to remove the Iranian opposition group, the MEK, from its list of designated terrorist organizations. In recent years the group, which has around 3,000 active members living in Iraq and other supporters all over the world, has mounted a high profile and well-financed lobbying effort to achieve delisting. At first glance Ms. Clinton’s decision changes little. True, the MEK will now be able to open a U.S. office and its U.S.-based bank accounts will be unfrozen. But in reality the ban against the MEK never really worked. In recent years it has had little difficulty organizing freely in the U.S. and rewarding many of its American supporters, from Howard Dean to Rudy Giuliani, with tens of thousands of dollars in speaking fees. And with the help of those advocates, the MEK has managed to rewrite its own past. Much of the press reporting on the MEK now reflects the messages put out by the paid lobbyists: that the MEK is a misunderstood Iranian dissident group committed to secular democracy. The MEK’s new squeaky-clean image stands in contrast to its history, much of which, ironically, is documented in State Department reports. As successive U.S. administrations have recorded, the MEK once killed American service personnel and businessmen and enthusiastically supported the kidnapping of U.S. diplomats in the 1979 Iran U.S. embassy siege. The MEK says it renounced the use of force in 2003, a claim that Hillary Clinton has now accepted. For its part, the Iraqi government sees the MEK not only as the enemies of its Iranian allies but also as a militia that was paid millions of dollars by Saddam Hussein to repress Kurdish and Shia rebellions. It has also complained that the MEK’s base in Iraq, Camp Ashraf, has become a no-go area: a state within a state. Many in Iraq, and other dispassionate observers, such as the Rand Corporation, believe that MEK is also a cult. It is led in perpetuity by a married couple, Mariam and Masoud Rajavi, who require their most active members to divorce and get rid of their children. Former residents of Camp Ashraf who have left the MEK say that they were allowed just one phone call a year to talk to their children. The MEK claims the divorces are voluntary and enable members to focus more intensely on regime change. As for the children sent to pro-MEK foster families in Europe and North America, the MEK says it’s for their own good. Aware of these bizarre practices and not trusting the renunciation of violence, some State Department officials argued against delisting. But the process was driven by a different concern: the fear that Iraq’s hostility to the MEK would result in a massacre and that Clinton would be blamed for having ignored all the warnings from pro-MEK lobbyists that a bloodbath was imminent. In both 2009 and 2011, Iraqi security personnel broke into Camp Ashraf killing over 40 MEK activists. Fearing a repeat on an even bigger scale, the State Department has been trying to maneuver the MEK and Iraq into accepting a compromise: that the MEK move from Camp Ashraf to a temporary facility near Baghdad airport—Camp Liberty—with a view to eventual resettlement as refugees in Europe and the U.S.
To get that done Hillary Clinton used the only lever she had. She told the MEK that if they gave up Camp Ashraf, she would delist them. 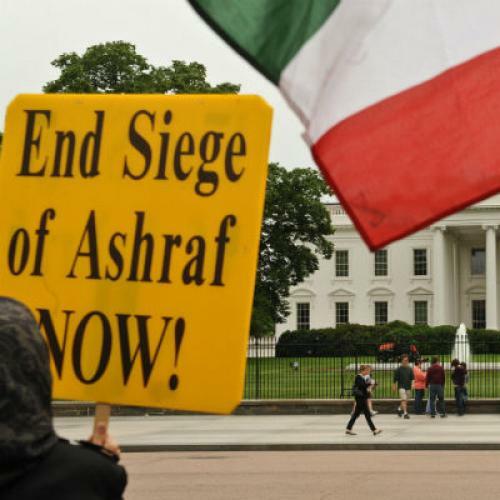 Over the summer the MEK believed that its lobbying campaign in Washington was going so well it would secure a double victory: delisting whilst remaining at Camp Ashraf. Somehow the State Department convinced the organization that would not happen and now, with only 200 activists (quite possibly including Masoud Rajavi himself) out of an original 3,000 left at Camp Ashraf, Clinton honored the deal she had proposed. The timing was determined by a federal court order that required her to make a decision one way or the other by October 1. Some of the MEK activists may now be resettled as refugees but, aware of their true history, traditional host countries have been reluctant to take them in. For those that remain in Camp Liberty, the UN is supervising its management, reducing the chance of Iraqi attack. And now, instead of being terrorists, the MEK can transform themselves into freedom fighters. Since the MEK was founded in the 1960’s thousands of the Rajavi’s devoted supporters have paid a high price for their opposition to the clerical regime in Iran. Many have been killed and those at Camp Ashraf have lived weird lives, unable to have relationships with their spouses or offspring. But after Hillary Clinton’s decision, a story of human sacrifice and suffering could turn into something with wider significance. The MEK enjoys remarkable levels of enthusiastic support in the U.S. Congress. There is a real prospect now that it will become the U.S.’s favored Iranian opposition group, attracting significant funding. It’s an old story. The Afghan Mujahedeen and the Iraq National Congress both enjoyed American largesse. The MEK could well be next in line. Former members of the MEK who have experienced the Rajavis up close find the idea that they want democracy in Iran quite laughable. The Rajavis, they say, want power. Many of the same U.S. officials, politicians and think tankers who once enthused about Ahmed Chalabi and Hamid Karzai are again confident that they can solve their foreign policy problems by backing a plausible alternative leader or, in this case, leadership team. Which is why the MEK’s ruling couple must feel that after decades of struggle and international isolation, the combination of the unfolding nuclear issue and the delisting takes them considerably closer to their dream of ruling Iran. Owen Bennett-Jones is a Ferris Professor of Journalism at Princeton University. Iraq, Iran, United States, Hillary Clinton, Camp Ashraf, Howard Dean, Rudy Giuliani, Masoud Rajavi, Department of State, Saddam Hussein, Iraqi government, The Plank, Iran U.S.